Software can solve almost any problem. The trick is knowing what the problem is. With about half of all software errors originating in the requirements activity, it is clear that a better understanding of the problem is needed. Getting the requirements right is crucial if we are to build systems that best meet our needs. We know, beyond doubt, that the right requirements produce an end result that is as innovative and beneficial as it can be, and that system development is both effective and efficient. 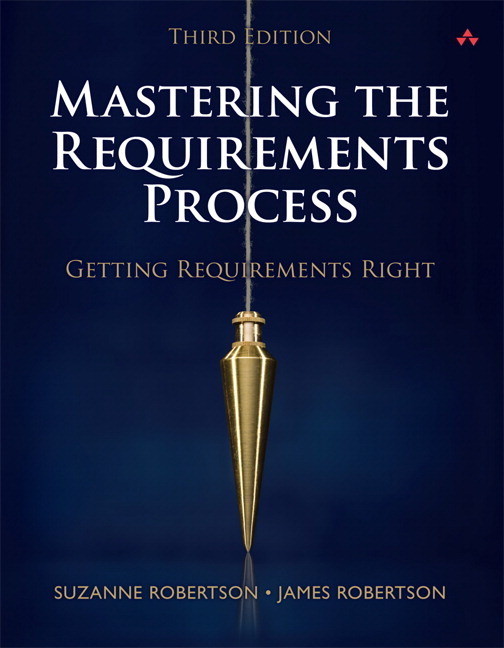 Mastering the Requirements Process: Getting Requirements Right, Third Edition, sets out an industry-proven process for gathering and verifying requirements, regardless of whether you work in a traditional or agile development environment. In this sweeping update of the bestselling guide, the authors show how to discover precisely what the customer wants and needs, in the most efficient manner possible. Suzanne Robertson and James Robertson have, over many years, helped hundreds of companies improve their requirements techniques and move into the fast lane of system development. Their courses and seminars on requirements, analysis, and design are widely praised for their innovative approach. The Robertsons are principals of the Atlantic Systems Guild, a well-known consultancy specializing in the human dimensions of complex system building. They are also the coauthors of Requirements-Led Project Management (Addison-Wesley, 2005). James Robertson and Suzanne Robertson have, over many years, helped hundreds of companies improve their requirements techniques and move into the fast lane of system development. Their courses and seminars on requirements, analysis, and design are widely praised for their innovative approach. The Robertsons are principals of the Atlantic Systems Guild, a well-known consultancy specializing in the human dimensions of complex system building. They are also the coauthors of Requirements-Led Project Management (Addison-Wesley, 2005).